The theme this time around made me wonder if there was some erudite meaning that I just didn't get. "Ordinary Matters"...hmmm. I was going to take a photo of my toilet - but, eh, nah. I was then going to get cutesy and take a photo of a glass with some black coffee in it and then open a page in one of my science magazines talking about a brain...and put a 3-way split screen...so you had your "dark matter", your "grey matter"...and then...well, a glass of water might be really ordinary. But, I thought that was a bit too bizarre...so I thought some more. My life is definitely ordinary. In fact, it's probably less than ordinary...so I figured I would show you pretty much the first thing I see when I open the door and step inside my home each and every day. But first, let's recognize Ziva - for, without her, we all wouldn't be on this cerebral trek of sorts. And the "we" I speak of are my fellow participants in this photography non-contest: MikeWJ, Nicky and Mike, Mo, Meleah, John, aka nonamedufus, Bryan, aka Unfinished Person, Malisa, Nora, LaughingMom, Tanya, Elizabeth A., 00dozo, Cheryl, Kristen, Katherine, and, last -- but definitely not least, Ziva. I live a life of disorganized clutter. I can't keep things pristinely clean no matter how hard I try. For example, I don't make beds. I always thought this was a waste of time -- and if I'm going to waste time, it's going to be on something more interesting than making a bed only to unmake it later on. My kitchen is clean (in a way) - all pots, pans, implements, silverware, glasses, plates and other things...are all extremely clean...sanitarily nearly. 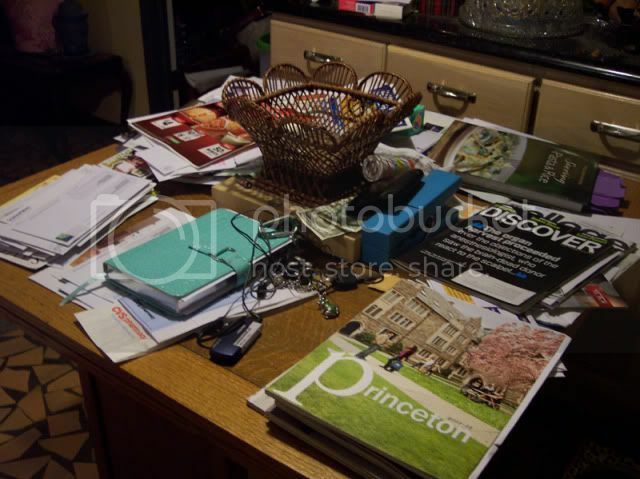 But, I can't, for the life of me, keep the kitchen table (which we never use to eat at anyway) clear of debris and not in a total state of disarray. When we come home - the keys get plopped on it, the bills get put on it, magazines, the rest of the mail, and all the other stuff in our hands -- get strewn onto it. When I make a recipe from a book or print one out, that gets put on it...and pretty much everything stays until it overflows. Oh, neat little piles will be made eventually...but, let's face it, they are only neat little piles of clutter really. As all of these objects are totally ordinary...and they all matter; they are in fact, by complete definition, "ordinary matters"...therefore they fit this theme. Thank you for skipping the picture of your toilet. I love the picture you went with. I think we all have those areas in our homes. I remember a former colleague at work who had n extremely messy desk. His desktop was his filing system, if you will. And over his desk was a sign that said "A clean desk is the sign of a sick mind." I'm with you, Mariann, I've definitely been looking forward to seeing what people choose for this one. :) And I loved your choice, it's such a great insight into your everyday life. I've always believed that a tidy desktop is the sign of a sick mind. You are right at the pinnacle of sanity. Our kitchen table and the couch, as you enter our little house, are both "hot spots" as my wife calls them for clutter. When we come home, those are the first places we plop things down on, so we more than can relate. You've definitely captured ordinary matters to us. I have one little tray for "stuff" and it drives my cleaning woman crazy. It's one little tray with "miscellaneous" stuff, random change, keys to something, a lipstick, a telephone number, pens, a tiny notepad. My husband thinks there are many such spots all over the house, but he is wrong. I love this photo of your ordinary matters. I love the photo you chose! Absolutely perfect for "ordinary matters" - well done, Mariann. My desk goes through stages. When I'm busy, it's messy as hell, with papers and books spilling onto the floor. When I'm not so busy, I put everything away and clean it until it shines. I prefer it the latter way, but I'm unable to keep from entering the former state. Ha! I think many of us can appreciate the "clutter syndrome" and how it has become a quite ordinary part of our lives. Nice take on the theme. Your ordinary looks very much like mine. Nice photo for the theme! Mariann, there's a name for this condition: flat-surface syndrome. I was raised by a procrastinating FSS mother and an "everything has a place and it damn well better be in its place" father. To suggest I'm neurotic wouldn't begin to describe what it's like in my head and my house. My desk clutter is so bad that when I would clean it, my teachers would come in and take pictures of my clean desk. They thought that was funny. In my opinion, creativity and orderliness just don't go hand in hand. I enjoyed your photo. Great interpretation of the subject. I love it. Seriously - I thought you were describing my house for a minute. Love the picture. Love the description. i felt like I was right there. Great job. I'm glad I'm not the only one who has this problem - and geez, Linda...I wish I had a cleaning lady to drive mad. Dammit! You lucky woman...no wonder you're so happy all the time.